So happy to find these! 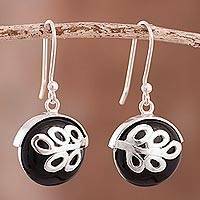 As I do not have pierced ears, I am always on the lookout for clip earrings. These are lovely-- contemporary and timeless at the same time. They are comfortable as well. I look forward to wearing them for many years. 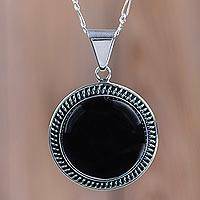 Obsidian Pendant Necklace 18K Gold Plated Sterling Silver, "Dusky Glow"
Sterling Silver Pendant Necklace with Andean Obsidian, "Moon Over Lima"
Mystical like the Andean moon, sleek black obsidian is mesmerizing. 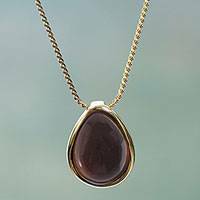 Fabiana Quispe sets the natural gem in a sterling silver necklace with bold, minimalist styling. 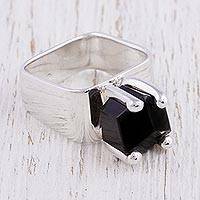 Taxco Silver Ring with Obsidian, "Facets"
Obsidian is a unique stone formed from volcanic lava. 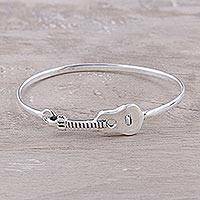 It has played a major role in the economy, spiritual customs, warfare, and of course, jewelry of ancient cultures. It was used as barter material, sharpened for arrows, spears and knives for spiritual rites, and mirrors. 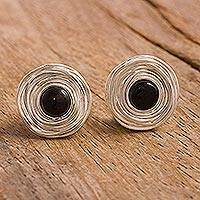 Visit Novica's gallery of obsidian jewelry and admire contemporary jewelry designs by artisan silversmiths across the world. 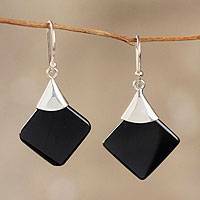 Sandra and Lily in Peru like the contrast between obsidian and silver, which they highlight in the modern design of symmetrical dangle earrings. 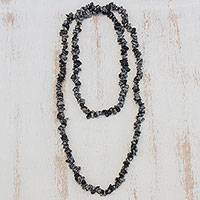 Claudia Llaury's two-in-one pendant necklace can be worn with obsidian on one side, Peruvian opal on the other. 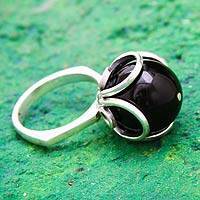 Our specialized obsidian jewelry collection includes mahogany obsidian silver rings as well as snowflake obsidian necklaces.